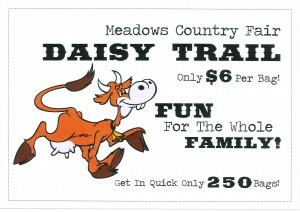 Grab a bag from the Cancer Council and Information Booth at the front entrance… and follow Daisy’s Trail! The Daisy Tail incorporates approximately 10 stalls throughout the Field Day, Animal Expo, Farmers Alley and Market Stalls. Its a fun way to explore the whole fair as well as enjoying all the fun activities on the way! You could win tickets for a trip for you and your family on the SteamRanger! Don’t miss out- we only have 250 bags, you wont want to miss out, so make sure you get in quick! Meadows Community Pharmacy and SteamRanger – Proudly supporting the Daisy Trail 2018!